Meet an 11-year-old boy from who suffers from bladk scales growing on his body – Ramesh Darji experiences difficulties with walking and talking, he has no friends as his peers are afraid of him. 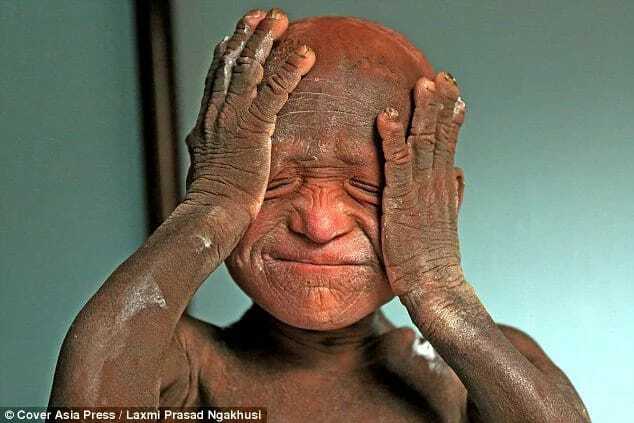 The boy is currently receiving treatment after his story hit international headlines Ramesh Darji was born with a rare condition that gradually turns him into a stone statue, leaving his skin covered by thick black scales. Ramesh Darji suffers from Ichthyosis Ramesh Darji suffers from Ichthyosis For 11 years the boy has been suffering from pain, he can’t move and even express his thoughts. The teen, who lives with his family in Baglung, the remote Nepalese region, doesn’t attend school and has no friends as his appearance scares other children. The 11-year-old has no friends, because the other children are too scared to come near The 11-year-old has no friends, because the other children are too scared to come near For a long time his mother Nar Kumari and father Nanda believed there was no hope for a cure, but help came from an unexpected source. Desperate parents visited local doctors who diagnosed him with a fungal infection but couldn’t help him. Ramesh’s skin first peeled off when he was just 15 days old Ramesh’s skin first peeled off when he was just 15 days old Nanda said: “His skin started peeling off 15 days after he was born and then new skin began to grow very thick. It hardened and turned black, we had no idea what to do about it. No one helped us. By this fifth birthday he began to say his body was in pain and he couldn’t walk. It seems even the doctors in the local area were unable to say exactly what was wrong with him It seems even the doctors in the local area were unable to say exactly what was wrong with him After years of trying to determine the cause it turned out that little Ramesh has been suffering from serious genetic skin disorder called Ichthyosis. However, neither Nanda nor his wife could afford expensive treatment only available in private hospitals. They had almost given up hope They had almost given up hope Ramesh’s luck changed only when a video about him was widely shared on social media and he eventually got help from Nepalese and British singers who organised a charity concert to raise funds for his treatment. The boy has undergone a series of tests and is now treated at the Kathmandu Medical College, where doctors hope they will be able to make his life easier.